Bloom in water reservoir in Sicily in winter 2006. Rossella Barone (rossella.barone@unipa.it). © Rossella Barone (rossella.barone@unipa.it). Type locality: Switzerland: Laks Morat (Silva 1996-to date). Suda, S., Watanabe, M., Otsuka, S., Mahakahant, A., Yongmanitchai, W., Nopartnaraporn, N., Liu, Y. & Day, J.G. (2002). Taxonomic revision of water-bloom-forming species of oscillatorioid cyanobacteria. International Journal of Systematic and Evolutionary Microbiology 52: 1577-1595. Feuillade, J., Feuillade, M. & Blanc, P. (1990). 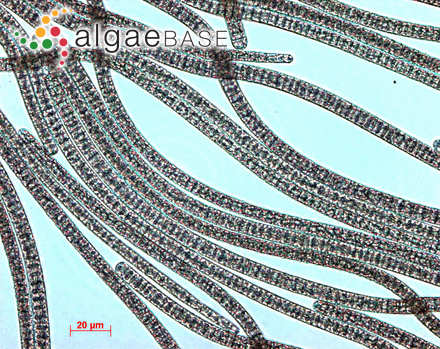 Alkaline phosphatase activity fluctuations and associated factors in a eutrophic lake dominated by Oscillatoria rubescens. Hydrobiologia 207(NOV): 233-240. Feuillade, M., Feuillade, J. & Fiala, V. (1990). The effect of light on the release of organic compounds by the cyanobacterium Oscillatoria rubescens. Aquat Sci 52(4): 345-359. Konopka, A. (1982). Buoyancy regulation and vertical migration by Oscillatoria rubescens in Crooked Lake, Indiana. British Phycological Journal 17: 427-442, 8 figs, 5 tables. Meffert, M.E. & Schwabe, G.H. (1970). Zur Bestimmung einer roten Oscillatoria -ein Beitrag zur Variabilität von Oscillatoria rubescens D.C.. Schweiz. Z. Hydrol. 32: 76-87.